The North Bend Rail Trail offers a scenic experience with splendid railroad elements and welcoming trail towns to be enjoyed. Stretching nearly 72 miles from Interstate 77 near Parkersburg (Cedar Grove) to Wolf Summit, the trail travels through an impressive 13 tunnels (10 passable), crosses 36 bridges, and passes through or near an assortment of state, county, and local parks. The trail is also part of the 5,500-mile, coast-to-coast American Discovery Trail. Though it is easily accessible from Interstates 77 and 79, and it runs parallel to US 50, the trail passes through wild and natural areas. You will find an abundance of wildlife, including deer and beaver, and the farmland surrounding the small, rural communities that grew up along the railroad corridor provide prime bird-watching. The North Bend Rail Trail’s many points of interest and history include the former Stage Coach Inn in Pennsboro, a marble factory, hand-blown glass factories, outlet stores, arts-and-crafts markets, fairs and festivals, sites of train robberies, veterans memorials, a bike shop/general store and the legend of the ghost of tunnel 19, the Silver Run tunnel. In the tumultuous years before the Civil War and the creation of the state of West Virginia, the rail corridor was constructed by the Baltimore and Ohio Railroad between 1853 and 1857. Thirteen of the railroad’s original tunnels remain. The number 10 tunnel, west of Ellenboro, is 337 feet long and is a “raw,” or natural, tunnel, meaning it was bored through solid rock. Many of the tunnels are quite long and require a flashlight or headlamp to safely navigate them. The true gem of this trail is the stunning natural scenery. Beyond the spectacular bridges and tunnels, the undisturbed beauty you are exploring makes you feel more like the explorers Lewis and Clark than a 21st century hiker. And like those adventurers, you’re likely to have some wildlife encounters, as well. Black bear, bountiful deer, grouse and more may cross your path. 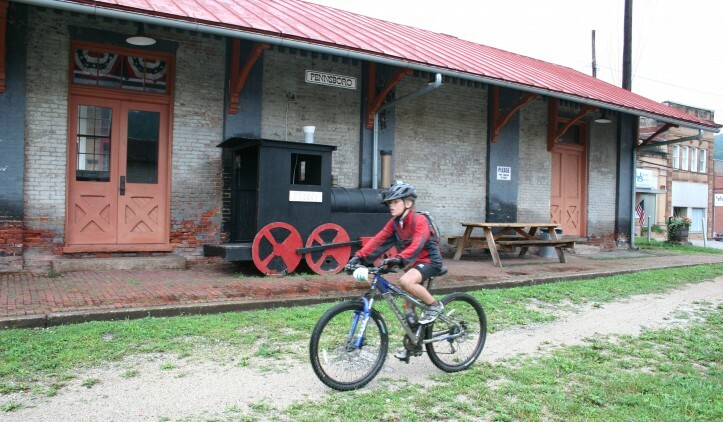 You’ll also encounter other trail users, particularly near the many quaint towns along the trail that have wholly embraced the rail-trail, building eateries that will satisfy even the hungriest of hikers. Towns such as Cairo, Pennsboro and Salem have all had restaurants pop up next to the trail. The locals are happy to share a story of the old rail line, and the staffs welcome even the sweatiest of customers. Spring makes for a slightly more difficult ride since the surface hasn’t hardened up yet, especially from equestrian use. But as with all trails, the NBRT’s work crew is busy repairing winter damage to insure good summer and fall riding. 202 North Bend Park Rd. To reach the Parkersburg trail head, take Interstate 77 to the Staunton Avenue Exit and turn east on State Route 47. Take the first right turn (about 0.2 mile from interstate) on Old SR 47. Continue about 0.7 mile and turn right on Happy Valley Road. Travel approximately 0.4 mile until you see a large house on the left. Immediately after the stone wall (Millers Landing) is the North Bend Rail Trail. Park on the gravel section opposite the trail head. To begin at Wolf Summit, take US 50 to the Wolf Summit Exit north. The trail crosses the exit. Mile marker 0.9 (near Parkersburg): Parking is available on the west side of Happy Valley Road. Mile marker 11.8 (Walker): Parking is available where the trail crosses Walker Road (east side of the road). Mile marker 18.8 (Petroleum): At Goose Creek Road, parking, a shelter, pit toilet, fire ring, camping, and picnic tables are available. Mile marker 26 (Cairo): The town has parking and stores. This will also be your first chance for food, water, and a bike shop (if coming from the west side). Mile marker 28.9 (North Bend State Park): You can access the park from the trail in approximately three-quarters of a mile; in two miles, you’ll reach the park’s lodge and opportunities for food. The park offers camping sites, restrooms, and parking. Mile marker 33.4 (Ellenboro): Parking, food, and restrooms are available in town. Mile marker 38.7 (Pennsboro): Parking is available at the train depot; food and restrooms are available in town. Mile marker 42.1 (Toll Gate): Parking can be found along the trail on the west side of the road. Mile marker 50: A pit toilet, shelter, and camping can be found in the rest area here. Mile marker 51.5 (West Union): Parking can be found here, as well as other services in town. Mile marker 54.2 (Smithburg): Parking, picnic tables, and a shelter are available behind the depot, as well as primitive camping in the county park. Mile marker 65 (Salem): Parking is available at the depot and services can be found in town. Mile marker 66.6: A pit toilet, shelter, and camping are available at this rest area. Mile marker 70.9 (Wolf Summit): Parking is available here at the current end of the open trail.